Congratulations to our CEO Graham Shapiro on winning category: Technology Entrepreneur of the Year at the EN Magazine’s North West Entrepreneur of the Year Awards 2016. Pictured above (from left to right): Nick Wheeler presents Graham Shapiro with the Technology Entrepreneur of the Year award. Graham’s other new business in Dubai, Reggie Enterprises, picked up Best Start-up Company of the Year. 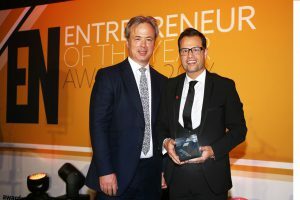 Pictured above (from left to right): Dr Robert Phillips, Lecturer at The University of Manchester, presents Graham Shapiro with the Best Start-up Company of the Year award, for Reggie Enterprises.